This is for a single gray fiberglass narrow mount Herman Miller shell chairs and 1 walnut dowel base. The bases are new and need to be assembled once you receive the chairs. These are vintage chairs and have been used but in amazing condition for their age. Some very small blemishes may be present but as you can see in the photos, they are very clean. The listing is for one complete chair. Multiple available. These are non returnable so please ask all questions before buying. Rare chance to buy one or two and add to your dining set, or just use one as a side chair. Great shape overall, upholstery aside. Chairs are very solid, no wobble or play, the bases are free of any bends, no dings or bruises to speak of, straight and clean. 20 1/4" D. 19 1/4" W. 38 1/2" H.
A set of four Danish mid century dining chairs model 77 by Niels O. Møller. This model was designed Niels O. Møller in 1959 and produced by J.L. Møllers. H: 77 cm, W: 50 cm, D: 50 cm, Seat Height: 44 cm. A set of six Danish mid century dining chairs model 75 by Niels O. Møller. H: 75 cm, W: 50 cm, D: 49 cm, Seat Height: 44 cm. H: 29.5 in., W: 19.7 in., D: 19.3 in., Seat Height: 17.3 in. A set of six Danish mid century dining chairs by H.W. Klein and produced by Bramin. H: 29.5 in., W: 18.9 in., D: 17.7 in., Seat Height: 17.7 in. Seat height 19". size 23 x 24 x 42". A set of four Danish mid century dining chairs model 75 by Niels O. Møller. The chairs vary slightly in height. H: 75 cm, W: 50 cm, D: 49 cm, Seat Height: 44 cm. Set of Eight (8) Chinese Chinese Chippendale Style Carved Hardwood Chairs with Openwork Grape and Foliage Motif. 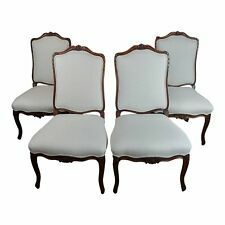 Includes: 6 side chairs and 2 armchairs. All are in good good condition. A set of four Danish mid century dining chairs model 316 by Peter Hvidt & Orla Mølgaard-Nielsen. The chairs were produced by Søborg Møbler. Two chairs with repairs on the top rail. The chairs have new Nevada sand-colored aniline leather upholstery on the seats.